Hello blog Peeps! The boys and I took off for a couple of days for, possibly, our last run of the season. Hoping to still get one more in, but it all depends on work, the weather, the moon and the stars. You get the idea. If everything aligns we’re golden. Speaking of the moon, the harvest moon is coming up this weekend. The Super Moon here. A dental appointment took up my Tuesday morning, and as I sat in the chair I kept thinking Miss Freedom wants to go somewhere. Yes, yes she does. Where would she like to go? Oh I know, somewhere EAST because that is what comes to mind first. OK, east it is. 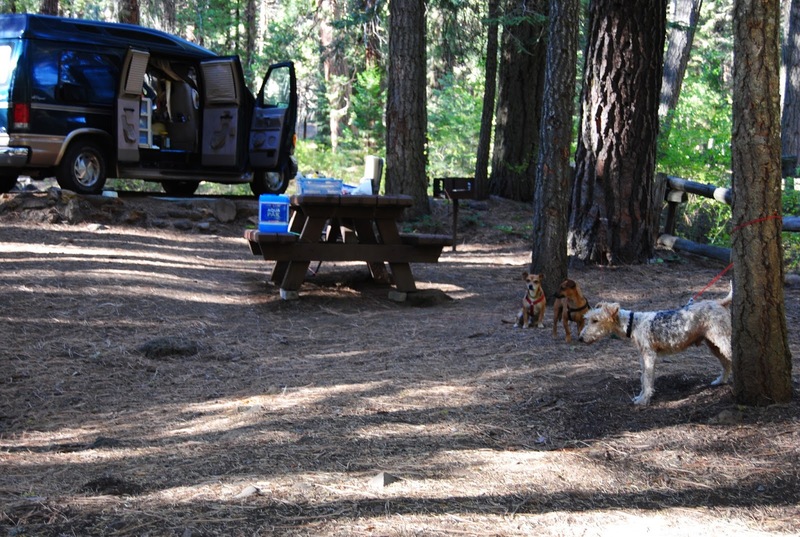 When I arrive home on this perfectly lovely, kind-of-on-the-hot-side late morning I grab my California Benchmark Atlas and choose Upper Rush Creek Campground just outside of the tiny little town of Adin, population 230 something. I throw some things together, load up the waiting Miss Freedom and off we go. 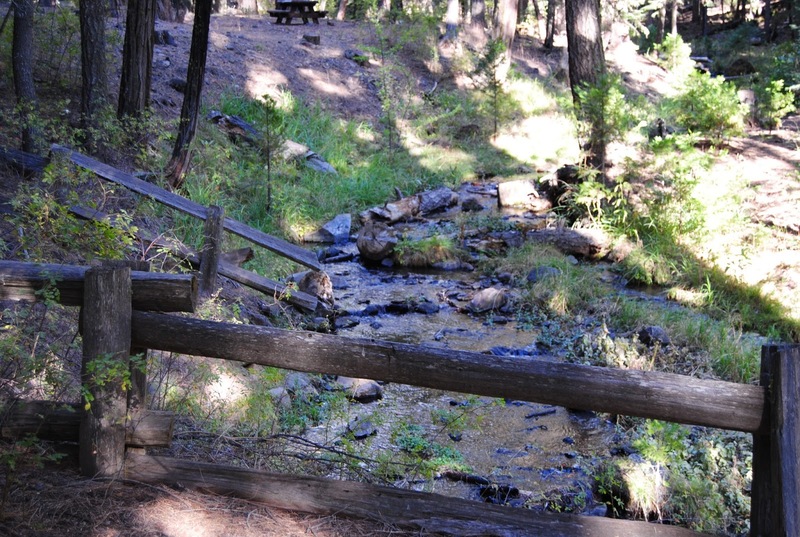 The campground is a few miles east of Adin and two miles off Highway 299. Once you get back there it’s heavily wooded with pines and cedars and true to its name Rush Creek tumbles and gurgles along one side of the loop of 10 campsites, ‘rushing’ to it’s unknown–to me–destination. We choose site number 3 on the creek side, and I set up camp. This consists of pulling out the backpacker stove, my anti-gravity chair, and the tie outs for the boys. A pig-headed wire hair fox terrier and two rambunctious minds-of-their-own chiweenies can’t be trusted to stick around. Oh they would come back, I am sure, but I am not into the stress and worry so they must stay prisoners of the camp. Poor things. I notice vault toilets and water spigots. Glad to see they have water, but I am kind of a water snob and used to drinking the best dang water ever out of my own tap at home so I brought some. The boys aren’t quite that discerning so they get creek water, and I take their bowl over to fill it up. No water. What the heck? Well, it is getting on in the year, perhaps they have already shut it off for winter. Glad I brought a couple of gallons; I’ll have to share my treasure with Burger, Fries, and Charlie. We are the only ones in this campground! How nice! The boys and I take a fast paced walk consisting of them pulling me along as fast as they possibly can; have to sniff and hike and pee on everything they possibly can. It might disappear, you know! And we take a short siesta. Short because I hear something skittering around outside the back side window. The boys are sound asleep which is a good thing, because I want to see what it is. Something catches my eye on the small pine just outside the window and I wait. Just a few seconds later a sweet little furry face peeks around the tree staring at the van as if to say what the heck are YOU doing here? It’s a Douglas squirrel, also known as the pine squirrel or chickaree, and he keeps circling the tree, hesitating every few inches on his way down the trunk until he reaches the ground. When he gets there he just stares at the tire for a time and cautiously digs around on the ground before leaping about two feet up and onto the trunk and he is gone. These are gorgeous little creatures with darker fur than a grey squirrel and smaller by half, and rusty red-to-orange fur on their bellies. I read several chapters in my book, the second in a three-book historical fiction series by Jane Kirkpatrick. Excellent reads if you like that kind of novel. 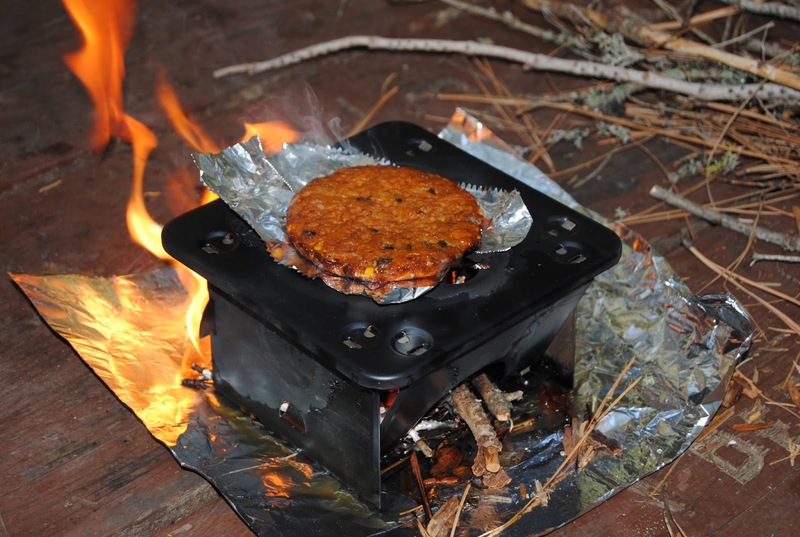 It’s time for dinner and I gather some twigs and pine needles and build a tiny fire in the backpacker stove to cook a veggie burger (doctor’s orders, no more meat. Dang!) . The boys and I enjoy the rest of the dying light in our little slice of heaven by taking another walk. It’s the last one of the day beside a quick before-bed pee run, then prepare to head inside our Vome where we settle in for the evening. And guess what shows up? Another van! They park two spaces up in camp number 5. It’s white, a cargo type vehicle, and has a pop up top! Nice. There’s a bicycle attached to the back bumper. I am going to go say hi and be nosy in the morning. I’d love to know if they are living in it, or just on vacation. Something tells me this is their lifestyle. Goodnight all. Hope you sleep as well as I know we will. See you tomorrow with “the rest of the story”. Hi, glad to see you've taken a few trips and the van is working for you. I'll be following along. So glad you got to get out again and I hope you have at least one more outing before winter sets in! Thank you! I so appreciate your interest and making a comment. Welcome to Two Dogs. Thanks so much. Tentative plans for heading north toward the end of October. Keeping my fingers crossed!